Review: Being heavy and deaf aren’t two good qualities to have when entering a new school. It won’t get you popular but it won’t make you a nerd either. But it will make you a detective when the most popular jock at Carbon High school is murdered. Join Will Halphin (a.k.a. “Hefty Houdini”) and Devon Smiley as they solve the mystery murder. The Dark Days of Hamburger Halphin was written by Mr. John Berk. Being heavy and deaf aren’t two good qualities to have when entering a new school. It won’t get you popular but it won’t make you a nerd either. But it will make you a detective when the most popular jock at Carbon High School is murdered. Will Halphin wants to figured out who murdered Pat Chambers and why. Was it the stunning Leigha Pennington? How about Mr. Fatzinger? Could it be Travis Bickerstokes, Pat’s good friend? To find the answers, all you have to do is find this book and read. I know who it is but I am not ready to spill. Overall, I think it was an okay book. I have heard the same plot a lot (only this time it is a deaf kid who solves the mystery). There is quite a bit of bad language in the book. It talks about very inappropriate things throughout the book. There is also a lot of swearing and it uses every word in the swear vocabulary. I would say that you would at least have to be in seventh or eighth grade to be eligible to read this book due to the language and inappropriate descriptions and scenes. Also, this book was not very appealing. It had so much bad language; it was hard to concentrate on the subject. The lack of originality is also a weakness because there are a lot of high school murder books out in the world. This book is almost the same as all of the others. Someone gets murdered, and, an unexpected detective solves the mystery. Overall, I would only slightly recommend the book to some people but I’d feel compelled to warn them about the swearing and inappropriate things going on. It is a decent book; it is unfortunate the author felt the need to pepper it with such foul scenes and language. 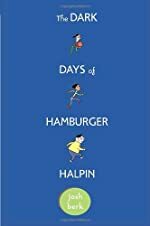 We would like to thank Random House for providing a copy of The Dark Days of Hamburger Halpin for this review. Have you read The Dark Days of Hamburger Halpin? How would you rate it?